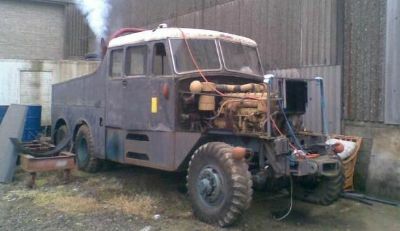 1960 Scammell Super Constructor 6x6. Reg - 473AGG. Bought new by Gavin Wilkie Ltd of Glasgow in 1960. Gavin Wilkie were bought out by Pickfords in 1965 who ran the vehicle in their Glasgow fleet until 1976. 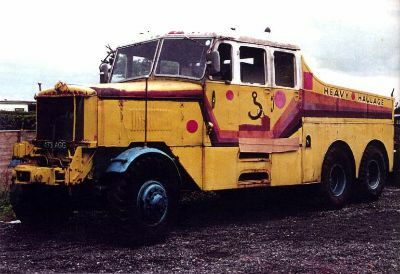 After retiring from Pickfords the vehicle worked on Windy Hill on the M62 for Rochdale Recovery before spending time on winching and recovery work in Ireland. Engine - Leyland/Albion 902, 15 litre producing 237 hp. Gearbox - Self Changing Gears 8 speed semi-automatic gearbox driven through a torque converter. 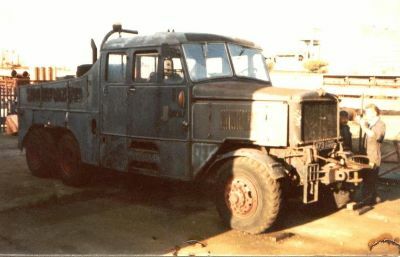 As retired by Pickfords in 1976. Repainted and working for Rochdale Recovery. Relining front brakes after front axle stripdown and refurbishment including complete rebuilding of R/H tracta joint. Radiator rebuilt and engine covers refitted. Ballast box removed for painting and winch refurbishment. Rear brakes stripped and relined. Lifting vehicle to our transport. Chassis blasted ready for painting. Back in the workshop for cab restoration. Several cab timber sections in need of repair due to a combination of water damage and a poor previous repair. Replacement parts made in Ash where required. 1969 Scania Vabis LB76. Reg - MEE667G. Bought new and operated by John Somerscales Ltd. 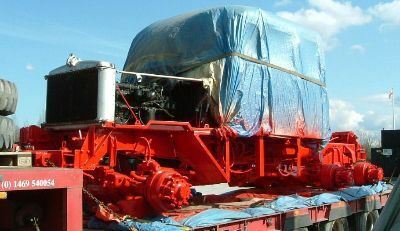 Currently in storage awaiting restoration. 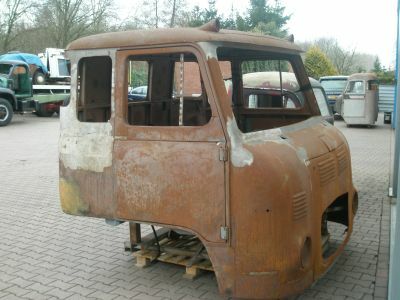 Replacement cab sourced in Holland and brought back to UK to be completed and fitted at a later date. 1959 Daimler Ferret Scout Car. Now completed and put back into full running condition.